It's that time of year again! Pumpkin treats start to make their debut around this time and in the past, canned pumpkin was a bit of a hot item in the grocery stores. Who knows how the pumpkin season will be this year so if you happen to see some canned pumpkin on the shelves, grab it and don't let go! 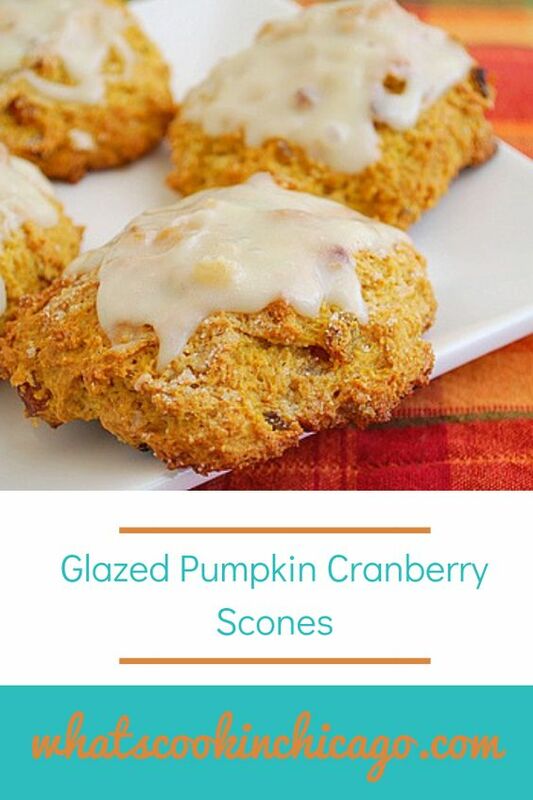 To kick off the season of pumpkin eats, here's a recipe for Glazed Pumpkin Cranberry Scones. Pumpkin and cranberries are two fall favorites that come together in this sweet breakfast treat that's delicious any time of day! These scones were made from my friend Britney and I've been holding onto this since April when she made them for a tea party I hosted. They were divine to say the least and I loved the combination of pumpkin and cranberries all in one bite. The glaze just added a nice touch of sweetness since the scones aren't too sweet on its own. 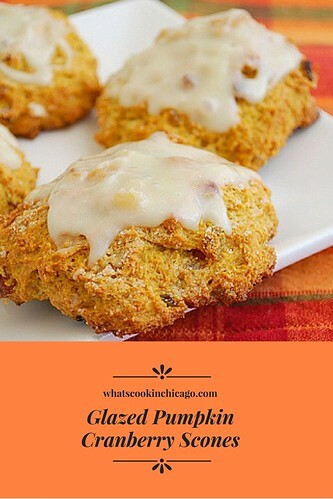 I can't wait to get some (gluten free) baking done in the coming weeks and incorporating pumpkin into more recipes! Preheat the oven to 425F and line a baking sheet with parchment paper; set aside. In a separate medium bowl, whisk together pumpkin, half and half and egg. In a large mixing bowl, combine all purpose flour, granulated sugar, baking powder salt, nutmeg, ground cloves, ground ginger. Cut butter into the dry ingredients, using a pastry cutter, until it resemble coarse meal. Fold in wet ingredients and cranberries into the dry ingredients and form dough into a ball. Bake for 14-16 minutes or until scones turn light brown. While scones cool, mix ingredients for plain glaze, using mixer on medium speed, until the mixture becomes smooth. Brush glaze over scones, when they are cool. 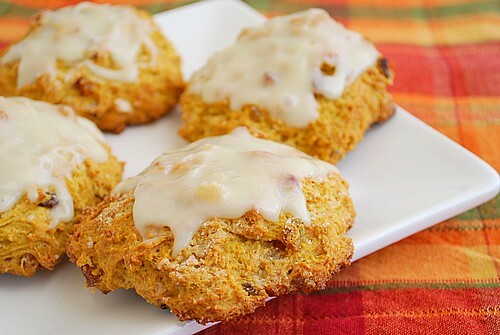 Have to tell you, those pumpkin scones look phenomenal! Pumpkin recipes are kickin' it and it's not even Fall yet! I love scones, that looks so palatable with the creamy toppings that it has. I'm loving all the pumpkin these days :) These scones look fantastic!